Police were called to the gated Bent Creek neighborhood in Lancaster County, Pa. Sunday. (Lancaster) — A black woman canvassing for Democratic congressional candidate Jess King is detailing an incident where police were called on her in a gated Lancaster County community. Dr. Amanda Kemp, a racial justice/mindfulness mentor and visiting scholar at Franklin and Marshall College in Lancaster, says she and her husband, who is white, were allowed entry to Bent Creek in Manheim Township Sunday afternoon after giving the name of a voter they planned to visit. But after they started knocking on other doors, Bent Creek resident Elizabeth “Duffy” Johnson told them they didn’t belong — saying Bent Creek was private property — and called police. They left, but after they returned home, a police officer showed up and spoke to Kemp’s husband. Kemp wrote a post titled, #Canvassingwhileblack on Facebook and says she is always aware of being a black woman, when moving in predominantly white places. Johnson is a member of the Republican Committee of Lancaster County and has been campaigning for Lloyd Smucker, the GOP incumbent King is challenging in the 11th district. She also teaches dining, social, and personal skills for the Etiquette School of Central PA. A woman answering the school’s phone Monday afternoon said she could take a message for Johnson but hung up when she was asked to identify herself. 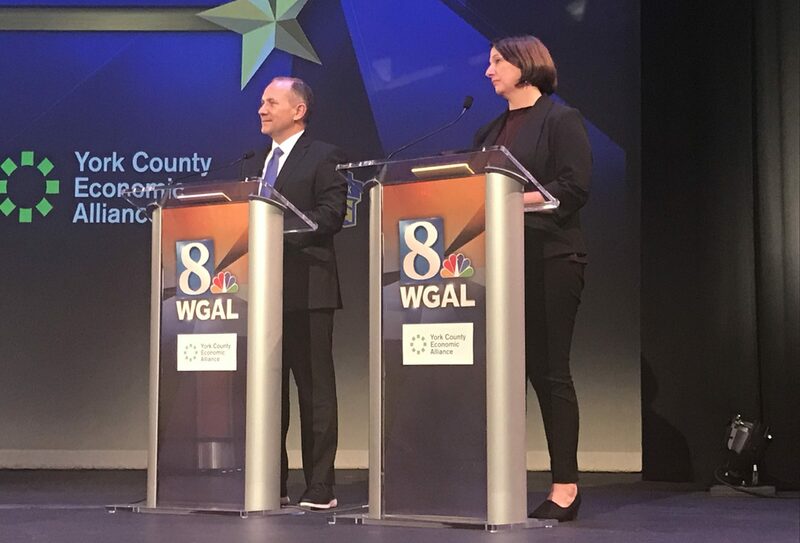 Republican Rep. Lloyd Smucker debated his Democratic challenger Jess King Tuesday, October 30, 2018, in York County. Johnson’s attorney Edwin Pfursich said in statement Tuesday that the story being portrayed on social media is not accurate. Neither Kemp nor her husband could say for sure why the situation unfolded as it did, but Kemp noted implicit bias is real, and it is a mistake to simply define racism as someone yelling the n-word. King’s campaign manager Becca Rast says there have been, historically, disputes between political campaigns and home owners’ associations about what counts as soliciting. Rast says the campaign will visit such communities but will leave if they’re asked to.